Mega Man Battle Network 5: Team Protoman brings back more handheld cyber battle. Emancipate the Internet once and for all, from the cyber-menaces that await Mega Man and Lan. A month has passed since the Dark Chip Syndicate was beaten -- but a new danger calling itself "Nebula" has risen. Team up with other cyberheroes in an effort to stop an evil organization from taking control of the global Internet. 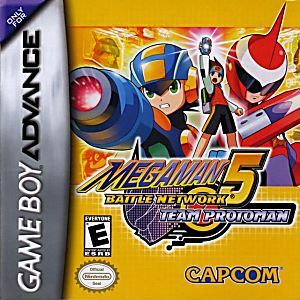 Battle Network 5 features two versions with distinct story lines and 6 unique enemy souls in each version. Not only that but your style, moves, and combinations are completely different!